All of the raw data is available online through the WFCAM raw data archive in Cambridge. Access to this archive is password protected and registration can be done through the on-line interface. All the UKIDSS data and calibration frames are also transferred to ESO where they are stored into a dedicated archive. The WFCAM Science Archive (WSA) is responsible for the archiving of the processed data. Reduced data should be obtained using the WSA interface. The WSA also provides access to the archive through the VO so both catalogue and images can be obtained using Astrogrid software. where query.sql contains the query to send. Remember to edit the python file to include your archive credentials. 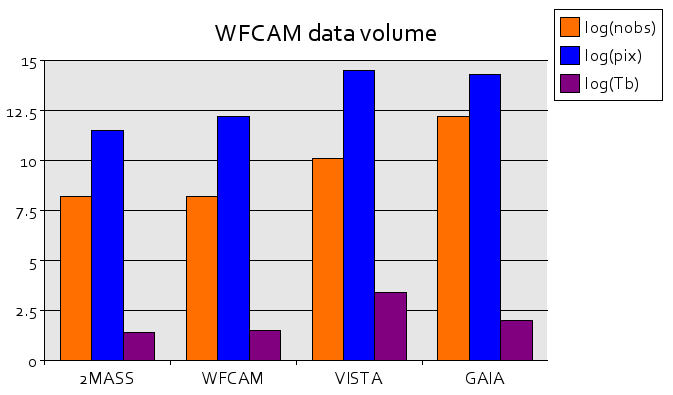 The figure below shows the data volume of WFCAM after the first year of operations compared to 2MASS and other future surveys with CASU involvement (colour key: log number of detected objects -orange-, pixels -blue- and archive size in Tb -magenta). One of the main results from it is that we already have processed the equivalent of the 2MASS survey!